I think I should put on record that Sign Solutions does not and has never received these rates. We campaigned vigorously for the contract to be split so that specialist agencies could take part . We had a statement by Sajid Javid read out in the house of commons to this effect. This lobbying unfortunately was not successful leading to the present scenario. The effect of agency subcontracting to agency does not make sense and is not good for anyone. The new tender process has now commenced and we are relieved to see that the tender is split into lots with BSL a separate specialism. Thought you might find this interesting; a titbit from across The Pond. I have been involved in fighting against the Capita (originally ALS) contract since they took over the North West police forces in 2010 and the original tender for the MOJ Framework was leaked to me when the tendering was still on-going. Looking at the face-to-face figures, this looks like unfair and potentially unlawful tendering practices and I wonder if NUBSLI may take this on? 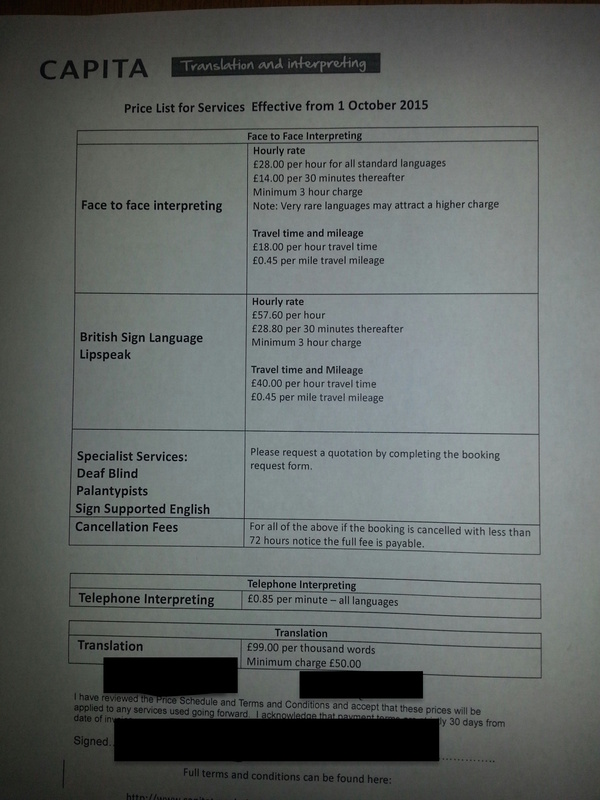 The BSL rates were similar to those your document quotes, but it is the foreign language rates that cause me a great deal of concern. ALS got the contract on the following rates: £31 all inclusive, one hour minimum, no travel time, no mileage, parking or public transport for Tier 1, £29 for Tier 2 and £26 for Tier 3. The new rates show that the value of the contract was increased hugely without going to tender. To give an example, when the contract was given to ALS, it was on the understanding that they would charge just £31 for a FL assignment lasting one hour, with travel time of two hours and mileage of say 40 miles return. The leaked figures show that instead of getting just £31, Capita would get around £140. This surely constitutes unfair tendering practices and a legal challenge should be mounted by the other agencies that bid for the contract. The other bidders lost because Capita was dirt cheap – but did the MOJ always intend to increase the value? The cut Capita takes from both BSL and foreign language interpreters is also unacceptable and should be looked into. I thought the BSL rates were inflated when I first saw them and taking over 50% is clearly not acceptable. BTW I do NOT work Capita and will be exploring a potential complaint to the EU Commission via my MEP, as well as other avenues how to challenge this. It remains to be seen whether this document is authentic. If these new rates are correct then we need an FOI request in a few months asking for the total payments to CTI – month by month- up to the end of December 2015. Then we can see if they’re receiving substantially more then they were for October and November 2014. With less than a year left to run before the contract expires, perhaps MoJ is giving Capita a windfall to make sure they made a decent profit over the life-time of the contract. After all, it would be contrary to Conservative philosophy for a private company not to make a ton of cash out of outsourcing public services. refuse to work for capita go private although the greedy bastards behind capita ,(politicians and the rich twats who are raking money in from this will deny any involvement , stand up unite ! !